We all feel the same commitment to care for our families. Helping you meet sharonopdahl.com your insurance needs is part 2534 17th Ave. S. • Suite F Grand Forks, ND 58201 of my commitment to you. Like a good neighbor, 701-746-0495 State Farm is there.® sharonopdahl.com CALL ME TODAY. SLOW COMPUTER? BROKEN PHONE? We Can Fix That & More! Arthur Wynne was the editor of the puzzle page in the magazine section of the Sunday edition of the New York World. In 1913, he was looking for something new, having grown tired of word squares, hidden words, and anagrams. Fooling around with a word square, he decided to alter it a bit. He called the result a word-cross. It was instantly popular, and became a regular feature. When it was left out one week, the paper was deluged with angry letters. For the next ten years, the World was the only paper that published crosswords. A rival paper, the New York Times, thought crosswords were merely a passing fad and predicted their swift demise. Come along with Tidbits as we do a crossword! •	In 1924, two young men formed a partnership and started a publishing company. Problem was, they had nothing to publish. Then one of the men went to dinner at his aunt’s house. His aunt was looking for a Christmas present for her daughter. She mentioned that the girl was addicted to the crossword puzzles published in the New York World. 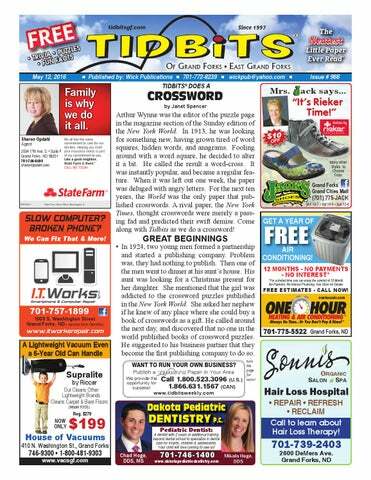 She asked her nephew if he knew of any place where she could buy a book of crosswords as a gift. He called around the next day, and discovered that no one in the world published books of crossword puzzles. He suggested to his business partner that they become the first publishing company to do so. turn the page for more! AIR CONDITIONING! 12 MONTHS - NO PAYMENTS - NO INTEREST* *For a limited time you can enjoy the comfort of 12-Month, No Payment, No Interest Financing. See Store for Details. • REPAIR • REFRESH • Latest Technology for Detection, and Repair • RECLAIM • Air Purifying Systems Call to learn Products about • Repair and Maintenance Hair Loss Therapy! 6. What planet is closest in size to our moon? 7. Name the song that contains this lyric: “Masquerading as a man with a reason, My charade is the event of the season, And if I claim to be a wise man, it surely means that I don’t know.” 8. What is the only king without a moustache in a standard deck of playing cards? 1. Where was the explorer Marco Polo born? 2. What is the green pigment in plants called? 3. What is the only river that flows both north and south of the equator? 4. How many teaspoons are in a tablespoon? 5. What is the capital of Nevada? •	When the two publishers told their consultants they intended to publish crossword books, the consultants felt the idea would fail—it would be too monotonous, they said. They were counselled to publish the book under a pseudonym so that if the book failed, their real name would not be associated with the failure. So they published 3,600 copies of the book under the name of Plaza Publishing Co. •	Advance sales were slow as booksellers felt the book would not sell. But on the day the book came out, the two publishers ran an ad next to the daily crossword in the paper. Book stores were swamped with requests—40,000 copies sold in the first few weeks. One distributor ordered 55,000 copies, then called back and ordered a quarter million more. Discarding their fake name of Plaza Publishing, the two men resumed using their original name: Simon and Schuster. 3. In 2015, the Colts’ Andrew Luck joined four other quarterbacks who passed for 300-plus yards in three consecutive NFL playoff games. Who else did it? (hint: 3 of them are retired) 4. Jason Day, at the 2015 PGA Championship, became the first player to finish 20-under par at a major championship. What had been the lowest mark, and who held it? CROSSWORD COMPETITIONS (cont'd:) •	In 1926 two men composed a crossword puzzle and placed it in several newspapers. They announced that anyone who correctly completed the puzzle and mailed it in with a $1 entry fee would be eligible to win the grand prize. Within the week, entries were arriving by the van load and they were taking their money to the bank in suitcases. •	Crossword competitions became so popular in India in the 1950s that parliament tried to make them illegal on the grounds that the fees to enter the crossword contests were leading people to financial ruin. •	In 1972 in the London Times, readers of the classifieds were amazed to find a strange page in the back of the section. All of the column headings were in place— cars for sale, houses for rent—but all the ads were missing. The only thing normal about the page was the usual crossword down at the bottom corner where it always was. Those who completed the crossword discovered amusing messages on the value of butter. The entire page was an attention-grabbing ad for butter. •	A San Francisco paper once sold advertising space in the little black squares of the grid. • Suspension & Lift Kits • Off Road Tires & Wheels • Bumpers & Winches • Running Boards • Nerf Bars • Access Covers • Bedliners • Snow Plows • Truck Caps • Bedslides • Rancher Grille Guards • Tool Boxes • Westin Accessories • Chrome Stuff • & More! © 2016 King Features Synd., Inc. World rights reserved. •	One crossword composer wrote the clue “to make a go of.” The answer was “succeed.” But the paper made a typo when printing it, and it said, “to make a goof.” Calls and letters poured in. •	The same composer was once called on by a cross crossworder who could not find the answer to the clue “manager of the Globe Theater.” He had called the Globe Theater and found it had two managers. Neither of their names fit. He was surprised to find the clue referred to William Shakespeare. •	An 8-year-old boy caught another crossword error with the clue “had a wooden leg.” Captain Ahab was the only answer that fit, but Ahab had an ivory leg, not a wooden one. We can help you get a car you will love. •	Then there was the man with bad handwriting who wrote the clue “Catholic chief.” The answer was “Pope” but the typesetter thought it said “Dope.” They got plenty of letters on that one. •	Another paper printed the clue “Confederate General.” The answer was U.S. Grant— and a lot of people were surprised to find that Grant was a Confederate! Apply at the Grand Forks Branch, online or by phone 24/7. •	One hard-up crossword writer printed the clue, “Six consonants and the letter ‘A’ five times.” “Panama Canal” was what he had in mind, but one indignant puzzler submitted a number of answers that also fit, including Bahama Macaw, Sahara Sarah, Havana Madam, and Abracadabra. •	One magazine in 1958 accidentally printed the wrong diagram with the right set of clues. A few people actually managed to reconstruct the crossword from scratch. 800.936.7730 • SERVICECU.ORG *Offer available on new, used and refinances. Includes existing federally insured by ncua Service Credit Union (SCU) loans with a $1,000 minimum cash out. Match Plus applies to auto loan terms and restrictions that are consistent with SCU’s 63-75 month loan rates. Other loan terms do not apply. If SCU cannot beat competitors’ APR, we will credit $100 to a qualifying member’s SCU account up to 30 days after SCU application, upon the applicant presenting a copy of their signed loan note & disclosure from the competitor. Qualifying member must apply, qualify and be approved for a SCU loan. Approval based on credit worthiness. If total income reportable equals $600 or more in a taxable year, the credit union will issue you a 1099-MISC. Certain restrictions apply on dealer financing. Private, non-commercial loan rates and terms are excluded from this promotion. Offer subject to change without notice. How large was the world's largest crossword? It was published in Quebec and contained over 82,000 squares; had more than 12,000 clues across and 13,000 clues down; and took up over 38 square feet. *Answers located further back in this issue. Q: I'm looking for the grave in this cemetery for the guy who invented the crossword. Do you know where it is? A: Sure! He's three down and four across! On 4 season Solariums when ordered by July 15! when ordered by May 31 Create your personal Haven with a Sunspace enclosure or sunroom and take advantage of the warmth from the sun without the bugs and wind! Get started by stopping by Sunrooms ‘Plus’ today! For future disposal of Large Items call 701-738-8740 for a Special Pickup or haul them to the city landfill. •	It was 20th-century English novelist E.M. Forster who made the following sage observation: "We must be willing to let go of the life we have planned, so as to have the life that is waiting for us." •	If you're a pogonophobe, the rise of hipsterism in recent years is not good news -- anyone afraid of beards isn't going to get far in public these days without confronting one. •	For centuries, the wrinkling of skin on fingers and toes when they soak in water was cause for puzzlement (among those who take the time to wonder about such things, if nobody else). Researchers believe they've found the answer: traction. Like the treads on a tire, the wrinkles of wet skin help improve the gripping power of our extremities; for our ancestors, this made it easier to walk and grip objects during wet seasons. •	You might be surprised to learn that immigration was not a national issue until the late 19th century. Up until 1890, when President Benjamin Harrison declared Ellis Island to be the first federal immigration center, foreigners who wanted to live in America were handled on a state-by-state basis. •	John Sylvan is known as the creator of Keurig coffee pods, used in abundance throughout the world these days. Despite the success of his inventions, however, he refuses to use them himself; he says that he abhors the effect the nonrecyclable, non-biodegradable pods have on the environment. •	Of all the actors who have portrayed James Bond in films before 2015, Pierce Brosnan racked up by far the most kills per movie. (The tally for last October's "Spectre" has not yet been counted.) *** Thought for the Day: "It is paradoxical that many educators and parents still differentiate between a time for learning and a time for play without seeing the vital connection between them." -- Leo Buscaglia © 2016 King Features Synd., Inc.
TIME FOR THE SOUNDS OF SUMMER! •	The homing pigeon is an ordinary sort of domestic pigeon derived from the common rock pigeon and trained to return home from long distances away. There is no real difference between a homing pigeon and a carrier pigeon aside from the amount of training it has received. •	Chinese officials began using homing pigeons to transmit messages as early as 500 B.C. In the 1200s, Kublai Khan set up a network of pigeons that linked the entire Chinese empire. The system survived for over 600 years. •	Caliph Aziz of Cairo had a passion for cherrries. In 980 A.D. he sent huge shipments of homing pigeons to the cherry orchards in Egypt. Slaves tied small bags containing one cherry each to the feet of the pigeons and sent them home to the Nile. •	Homing pigeons made a fortune for the French Post Office during a siege of the Franco-Prussian War in 1870. The Prussian army encircled Paris, cutting telegraph wires, destroying communication cables, and strangling the postal service. From the surrounding countryside, about 1,000 privately owned homing pigeons were donated and the "Pigeon Post" was born. To get the mail through, messages were set in type, photographed in microscopic size and printed on thin film. Each bird could carry up to 8,000 letters per day in this manner, and two birds were dispatched each day. At a cost of ten cents per word, postal revenues brought in about $112,000. By the time the seige was over, pigeons had carried nearly 100,000 messages from Paris to the outside world. •	In 1814, Nathan Rothschild learned of Napoleon's defeat at Waterloo by carrier pigeon a full day before the general public new. As a result, he made a killing on the stock market. •	During World War I, nearly 200 soldiers of New York's 77th Infantry Division became isolated from other American forces. They were surrounded by enemy troops, and found themselves under fire from their own artillery. They had three homing pigeons and no other method of communication. On October 4, 1918, a message was attached to the leg of one pigeon and it was released, only to be shot down. The second pigeon was also killed. They had only one pigeon left—a carrier pigeon called Cher Ami, which is French for "dear friend." The message tied to his leg read, "Our artillery is dropping a barrage on us. For heaven's sake, stop it!" The bird was released, only to be shot through the leg. Miraculously, he kept flying— and was shot through the breast. But the bird kept going and arrived at his loft with the message barely attached to his mangled leg. Within hours help arrived and the 77th Infantry Division was saved. Cher Ami was awarded the French "Croix de Guerre." He died in 1919 as a result of his wounds and his remains are on display at the Smithsonian. •	In the 1980s Lockheed's plant in California employed 15 carrier pigeons to carry microfilm capsules to the test base 30 miles away. The pigeons could make the trip in 40 minutes, faster than a courier in a car could. Also, they had an effectiveness rate of 100%. They never delivered to the wrong address, or showed up with damaged goods. •	Homing pigeons and migratory birds can be deflected from their routes by radio transmitters. Homing pigeons cannot find their way if a magnet is tied to their necks. •	The longest flight by a homing pigeon was 5,400 miles by a bird released from West Africa which travelled to its home in England in 1845. The trip took two months, and the bird fell dead only one mile from its loft. •	On May 19, 1715, the colony of New York passes a law making it illegal to "gather, rake, take up, or bring to the market, any oysters whatsoever" between May and September. This regulation was one of many passed in the early days of America to help preserve certain species. •	On May 20, 1873, San Francisco businessman Levi Strauss and Reno, Nevada, tailor Jacob Davis are given a patent to create work pants reinforced with metal rivets, marking the birth of one of the world's most famous garments: blue jeans. They were originally called "waist overalls." •	On May 21, 1881, humanitarians Clara Barton and Adolphus Solomons found the American National Red Cross to provide humanitarian aid to victims of wars and natural disasters. •	On May 18, 1917, six weeks after the United States formally entered the First World War, the U.S Congress passes the Selective Service Act, giving the U.S. president the power to draft soldiers. Within months, some 10 million men had registered. •	On May 16, 1929, the first-ever Academy Awards ceremony is held. Some 270 people attended, and tickets cost $5 each. After dinner, complete with numerous speeches, actor Douglas Fairbanks handed out 15 awards in a fiveminute ceremony. •	On May 17, 1965, after a two-year investigation, the FBI declares the supposedly pornographic lyrics of "Louie Louie" to be officially unintelligible. Agents had purchased numerous versions of "Louie Louie" played and re-played the song at different speeds in their laboratory. © 2016 King Features Synd., Inc.
Life is worth Living: Coping after Trauma Learn a new way to reach the survivors and the families of those who survive trauma. Thursday, May 19, 7 p.m. - 9 p.m.
DC FABER a retired Major from the U.S. Army, retired from the Wyoming National Guard, and retired from the Laramie Fire Department as the Division Chief of Fire and Life Safety. •	On May 22, 1856, Rep. Preston Brooks (DS.C.) savagely beats Sen. Charles Sumner (RMass.) in the halls of Congress as tensions rise over the expansion of slavery. Wielding the gold-topped cane he used for injuries suffered in a duel over politics in 1840, Brooks entered the Senate chamber and attacked Sumner at his desk. Event is free and open to the public, free will donations will go towards the Veterans Memorial Wall. SUMMER PROGRAMS & EVENTS 2016 There’s a wide variety of enrichment activities available this summer at the University of North Dakota such as athletic and educational youth camps, professional seminars, and social events for all ages. Visit our website for a full listing of what Summer @ UND has to offer from May 15 to August 15. © 2016 King Features Synd., Inc.
• “Dust from the top down, and clean walls from the bottom up. Dust falls, so by the time you get to the bottom, you’ve got it all, but drips are easier to clean off when the wall is already clean.” — I.M. in Ohio • Here’s how to ballpark the temperature of your camping fire for cooking. Arrange a cooking pot over the fire. A Dutch oven works best. Hold your hand about even with the side. Beginning at 550, count backward by 50 — i.e., 550, 500, 450. When you have to remove your hand, you’ll have an approximate temperature of the coals. • “Got a great pair of jeans with a zipper that just won’t stay up? Try this fantastic fix. Take a metal ring (like the one on a keychain) and feed it through the zipper pull. Then zip up. When you get to the top, loop the metal ring around the button, then button up the jeans. That barn door is staying closed!” — S. in Oregon • You can thread a needle better if you spray the thread end with hairspray. It stiffens the fiber, which will then stay straight. • “After hand-washing an item, rather than wringing it out, place it between two towels and just run a rolling pin over the top towel.” — A.D. in New York • Use an old lip brush to take care of stray nail polish mistakes when you’re painting your nails. It’s much better than trying to use a cotton swab, since no strands of cotton get left behind. A lip brush is small and tight, so it can get into precision spots. You can use a cotton pad with a little nail polish remover on it to clean it up after you’re done. Send your tips to Now Here’s a Tip, 628 Virginia Drive, Orlando, FL 32803. State Farm is there. CALL ME TODAY. We Can Fix That & More! On September 11, 1952, the first artificial aortic valve was installed in a patient in Washington, D.C. Come along with Tidbits as we take a look at the human heart! We provide the opportunity for success! Hair Loss Hospital • REPAIR • REFRESH • RECLAIM Call to learn about Hair Loss Therapy! Writer James Thurber was in the hospital doing a crossword when he asked a nurse, "What 7-letter word has three U's in it?" The nurse replied, "I don't know, but it must be unusual." •	“Azalea” comes from the Latin “azaleos” meaning dry or parched. The plant was named in the belief that it grew only in dry soils. •	“Rhodon” is Greek for rose, and “dendron” means tree: rhododendron. •	Iris was the goddess of the rainbow who was in charge of receiving the souls of dying women. The god Juno was so impressed with her purity that he named a flower after her. •	Lobelia was named in honor of botanist Matthias L'Obel. The wisteria vine was named after naturalist Dr. Casper Wistar. •	Marigolds were named after the virgin Mary: Mary's gold. •	“Phlox” is the Greek word for fire, and phlox was named because it is fire red. Phlox is also the root of the word “phlegm,” because phlegm was thought to cause fiery fevers. •	The Greeks thought that the leaves of the common garden flower alyssum could cure the madness caused by being bitten by a rabid animal. Since “lyssa” was the word for madness and “a-” is a negative prefix, the alyssum was born. •	Columbine comes from the Latin word “columba” meaning dove because the flowers resemble a circle of doves. •	Larkspur was so named because the flower resembles the spur on the back of the feet of birds in the lark family. •	“Primus” is Latin for first, and primrose is one of the first flowers to appear in the spring. •	The Sanskrit word “parna” meaning a wing or feather became the German word “farn” which became the Anglo-Saxon word “fearn” and is now our fern. •	Lichens come from the Greek verb “leichein” meaning to lick up, because they seem to lick their way across the ground. DIFFERENCES: 1. Sign is missing. 2. Bandana is different. 3. Bullet belt is missing. 4. Cloud is missing. 5. Gun is different. 6. Earpiece is missing. © 2016 King Features Synd., All rights reserved. ELITE Carpet Cleaning Services, Inc. WINDOW TINTING Reduce Glare, Heat, and Block Harmful UV Rays from damaging your vehicle. "Crossword Puzzles," "Homing Pigeons" and "Planet Names"